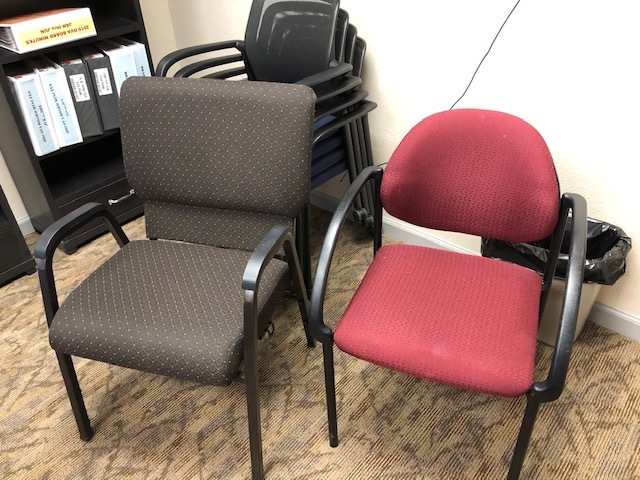 The new East Rec chair with ARMS (left of the older red chair)has been in the OVA office for all interested homeowners to sit in as a test for a few days now. So far, all the written comments are positive. Stop by soon if you want to experience it yourself! All of these new chairs are 2 inches wider than normal (room to grow in!) and have excellent back support. 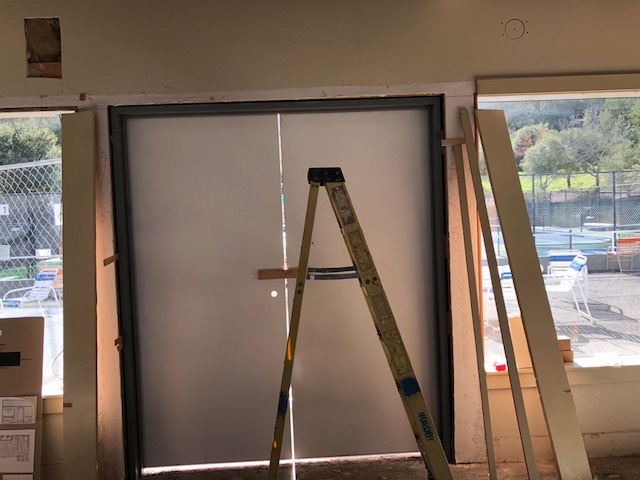 Meanwhile, at the East Rec new interior doors are being installed with durable commercial grade metal jambs for the bathrooms. Below the new solid core exterior doors to replace the glass doors with shades are also being installed. There were several reasons the 4 sets of East Rec glass doors in the main hall were replaced with solid doors. We were having trouble getting a complete black out for the doors when movies and powerpoints are being shown during the day, when darkness is desired. 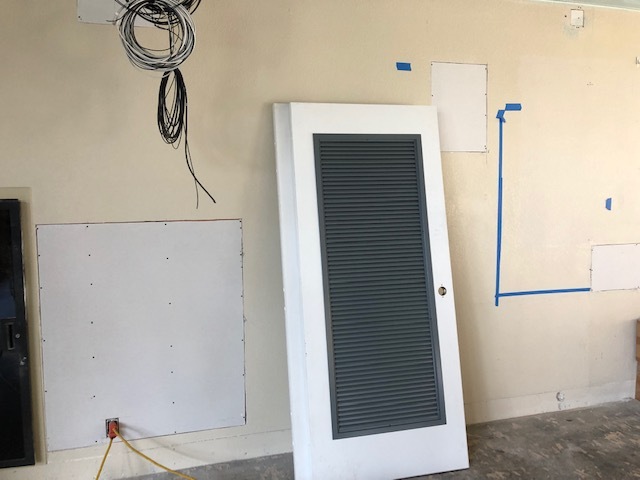 Also these new solid doors have a quieting effect from any activity occurring outside, such as pickleball or “wild” hot tub parties ( just kidding-I have not been invited to any “wild” hot tub parties-have you?). We have European Rolling Shutters specified for the outside of the windows on the pickleball court side, which are not installed yet. These outside shades provide 3 things we needed-1-quiet, 2-darkness for movies & powerpoints and 3-more fire protection in case of blowing wildfire. 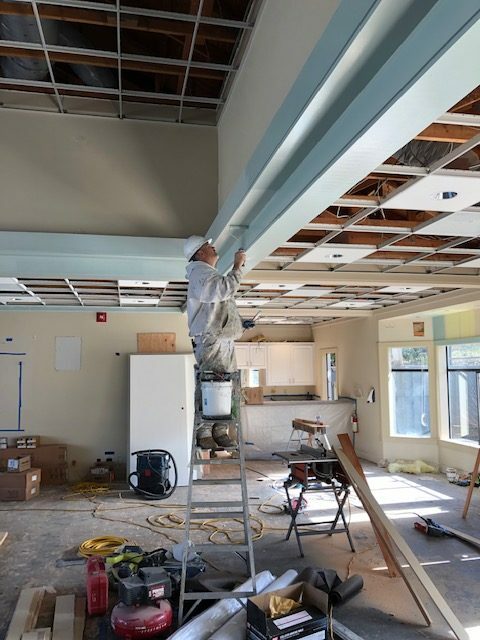 Painting of the ceiling beams has begun. 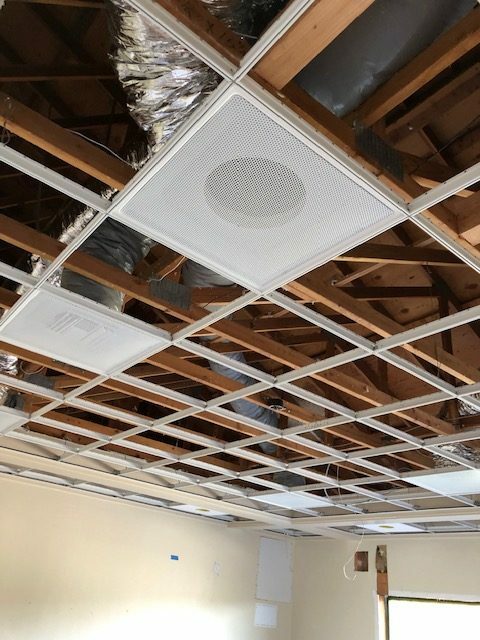 We have new vented acoustic ceiling tiles (left one below ) where heat and air conditioning are to come through. Below the access holes that were cut in the sheetrock for wiring, etc. are now being patched and mudded. More patches of sheetrock and the replacement exterior doors to the pool equipment room downstairs have arrived. Well, now we know that the new spa does not leak. Look how it holds rain water! 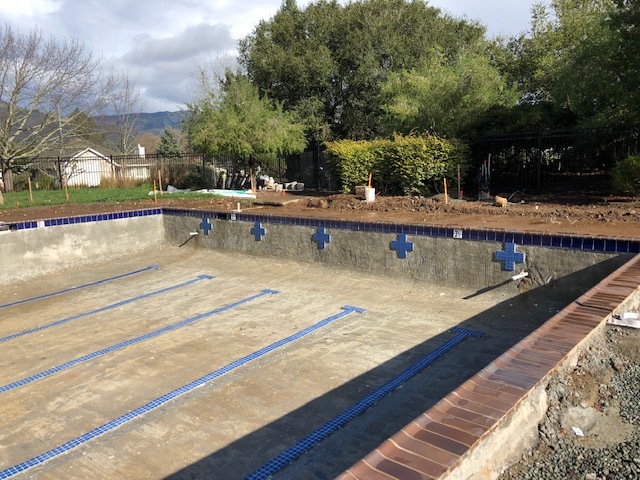 The tiling for the pool is complete. 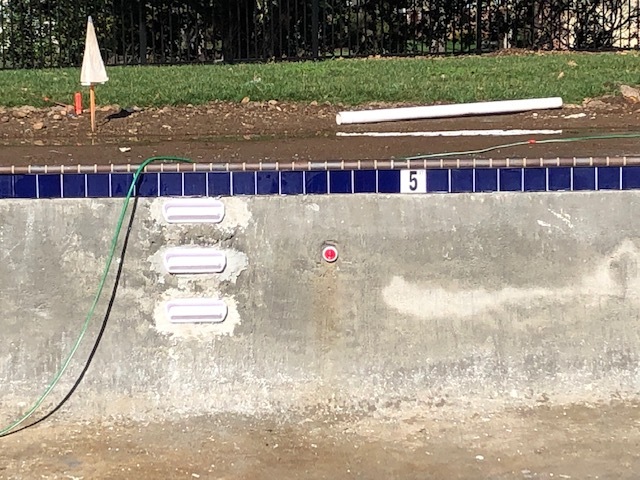 The little red circle in the concrete wall of the pool below is where one of the new underwater pool lights are being installed. Below-The roof for the addition is complete. 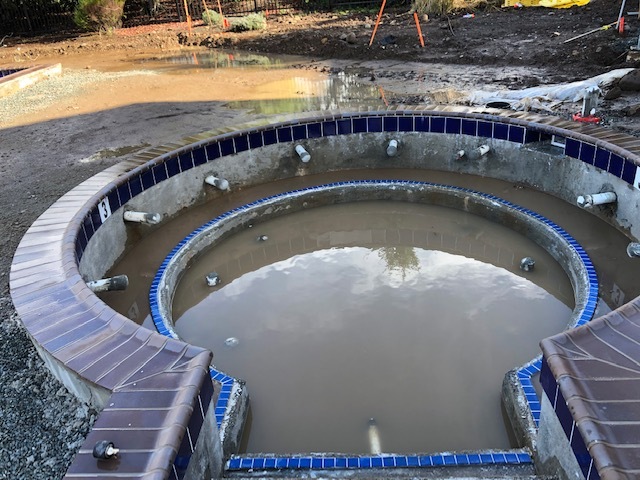 The area around the pool needs to dry out a bit before the bulldozers can come back in to level out for prep for surrounding pouring concrete pool deck. 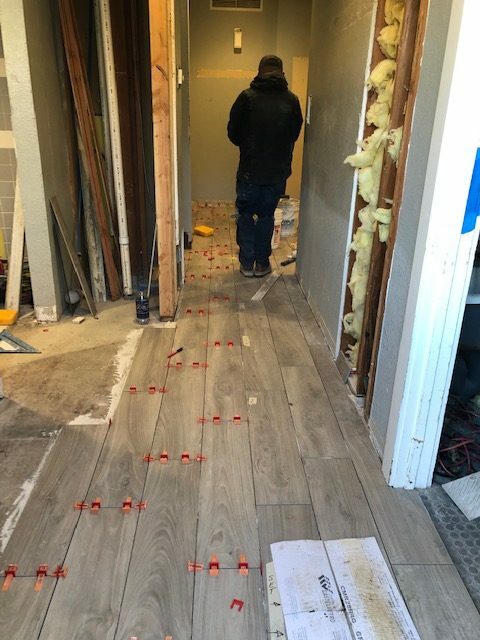 The installation of the new ADA slip resistant floor tile in the downstairs bathrooms & locker rooms will be completed by end of this week. 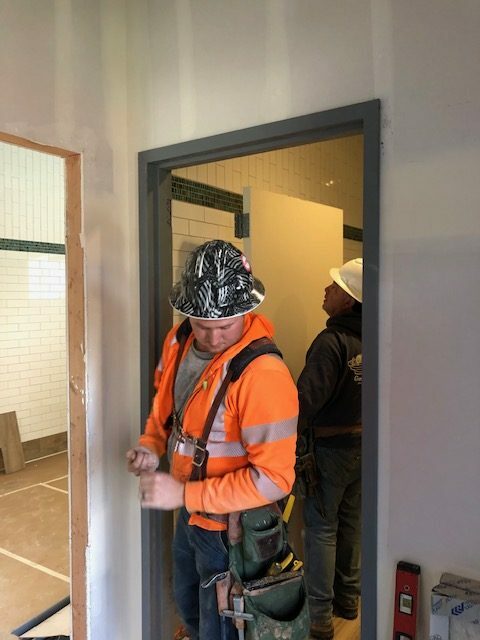 NOTE-It is still important for those who are dripping wet to be careful when walking on any floor tile entering the locker rooms or even walking on the new concrete pool deck, when it is completed later. All will meet ADA non slip compliance laws, but slip accidents could happen if someone is walking too fast in wet conditions. We hope you always take big beach towels and robes to dry off a bit after exiting the pool or spa and before entering the locker room. 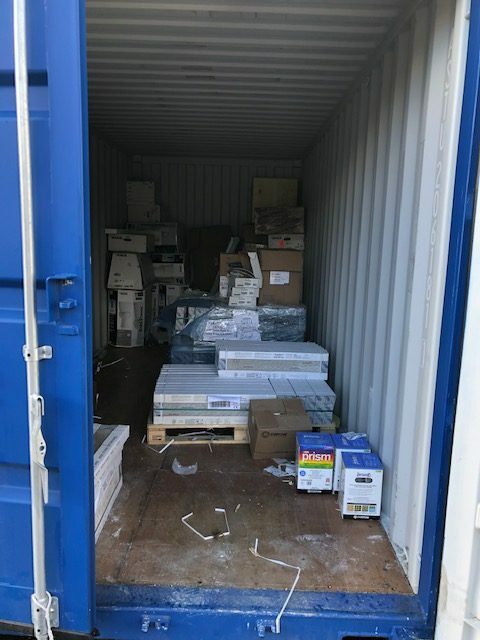 The storage container sitting in the parking lot still has product in it that we are going to install soon…more tile, plumbing fixtures, and decorative bathroom lighting fixtures. The fire line permit will be ready this Friday. 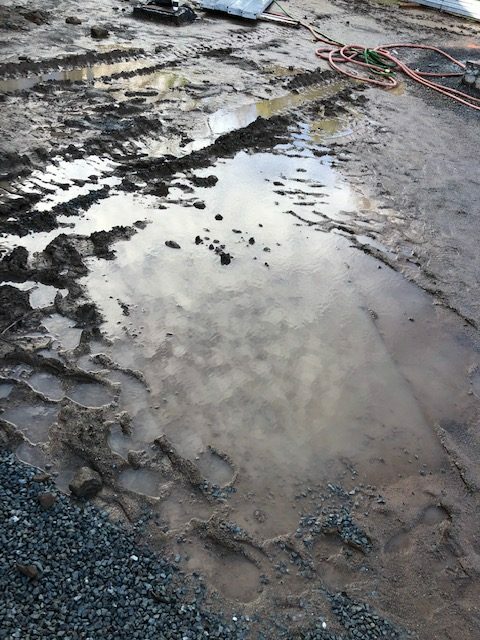 When that work starts, we are going to have to close the parking lot for a week to 10 days (weather dependent) to dig across the parking lot and down to the street to connect to the city water. 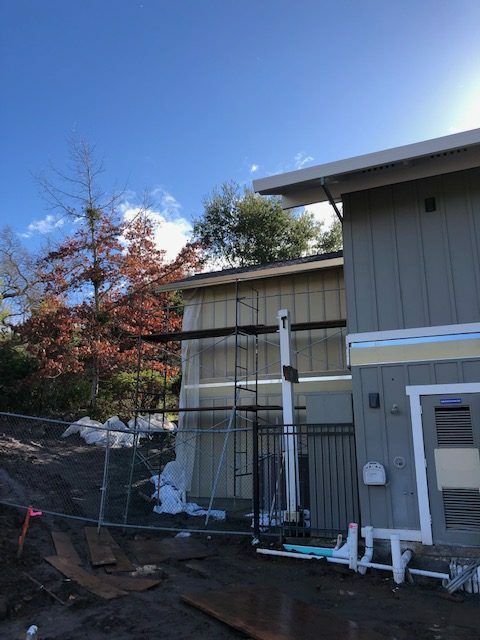 We are required to upsize the delivery line of water to the East Rec due to adding the fire sprinklers, which need a lot of water delivery power in case of fire. We will let you know those dates next week. The Fire sprinkler company has its first inspection this Thursday. 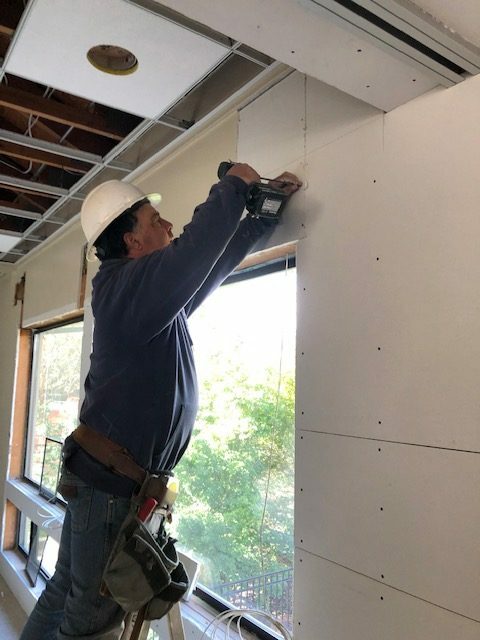 This inspection is for the inspector to see all of the pipe that is being installed throughout the building while laying on the ground or floor. They want to make sure there are no weak welding joints, etc. and that it is good quality sprinkler pipe. Pipes are under a lot of pressure from water flow when they deliver water to put out out fires. The Berger seismic corners now need the metal holddowns to be attached on the outside. Troy is waiting for special pieces to arrive, now that the engineer has approved the modified changes due to field conditions. He will put those in when he has time to allot, in between the higher priority of the East Rec., which now has multiple trades working on the site as we get closer to completion. Note: Critical path scheduling means the items with multiple steps that have the longest time to complete get priority and the activities that do not require a long time are worked in as the schedule allows. This is considered good time management skills and allows big projects to be completed in a more timely manner.